I, too, used Humbrol, more than 35 years ago. Wonderful memories, and the colors have held true over years of usage. Nostlagia, it is not what it used to be. Funny, the one bottle I never bought was the British Uniform Red as I simply could not believe the shade shown….brick red. Brown/orange, nothing like the defenders of Rourke's Drift in the film. Of course now I know, but, to be honest, I still paint mine in a much prettier brighter red. Good Lord! My alter ego of Jefthing has surfaced and I completely forgot about this thread! I still have the tin of Airfix M11. And I will follow Calculon's lead and have a tin of Humbrol gloss wafted under my hooter. And then buried with said tin of M11. I remember my Nana rang the local radio 'agony aunt' phone in show, because she'd heard of solvent abuse and thought that my huge Authenticolour collection indicated I was an addict! Little did she know, I was addicted, but to the subject, not the solvent. Still am really, 46 years later. Anyone remember the Authenticards? I bought mine from Beatties, and the illustrations of Hinchliffes led me to the much missed Nottingham Model Soldier Shop. 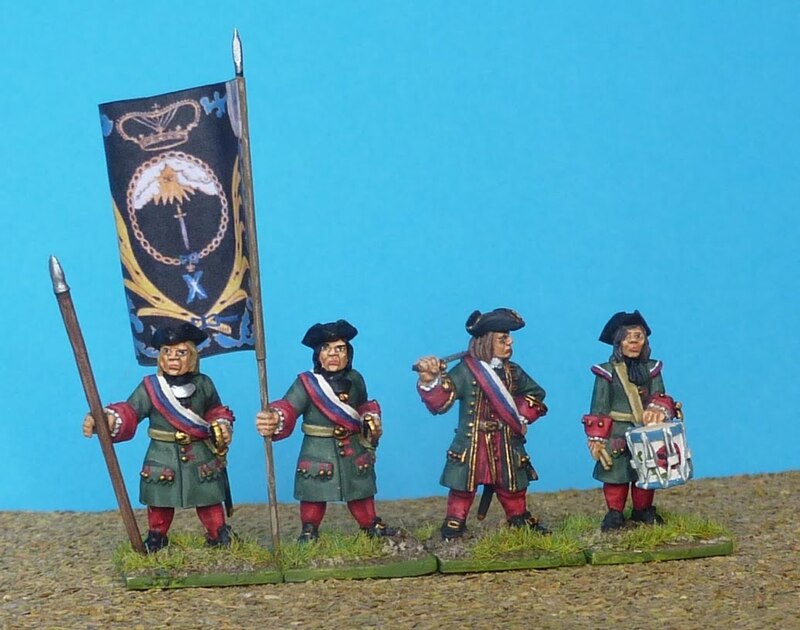 My pocket money only stretched to one figure a week (a fortnight for cavalry) and I'd spend all week painting it. Happy days. Weird cross-over with the Hinchcliffe painting guides! I'm still using Humbrol, addicted since around 1975 when I got my first Hinchliffe figures from a wonderful small shop near Blackpool Tower. A British 9 pdr gun and five crew, along with a few tins of enamel and a 0 brush – which is still in use! And yes, I still have some Humbrol authenticards. Happy times. I also still use Humbrol paints almost exclusively. Been trying to use acrylics over the last week and just don't get along with them at all. You still use those enamels………..? deadhead – They can't be mixed? I mix them all the time. No problems! "A place where shops and/or small businesses trade from"
"Trade from" is like selling products, conducting business or is it bartering? I have you all beat. I actually started out with Testors paints in the little glass bottles. I used them to paint car and airplane models and just migrated them over to figures. Then I discovered Humbrol and I had dozens of the those tin cans. I also used Testors' model master line of paints at the same time. They were all kind of a pain when it came to taking off those lids and keeping them on so the paint wouldn't dry. Great memories, but I was more than ready to switch to acrylics. "The Humbrol British scarlet that I always thought was too orange…"
That's exactly what I thought. I had to mix it with red. I still hanker after the little glass Airfix bottles of paint, like truncated obelisks. The Airfix tinlets annoyed me because they were a different height to Humbrols so they didn't stack. I had a big exam to sit when I was 13, to get a scholarship to a very good nearby school. It was founded in 1561 or something, and was eyewateringly fee-paying (it's about £20.00 GBPk a year these days). But then, if you did well in their exam you got in for nothing. So for about a year before that exam I had no life as evenings, weekends and school holidays were spent on tutoring and homework. During that time my hobbies were banned as dissipations of concentration. So I saved up and spent pocket money on my first ever stash of kits and figures and paint (normally I was tearing at them before I got them home). The kit stash was a 1/72 Catalina, Lancaster, and Hercules with Bloodhound missile. The figure stash was the Airfix Gun Emplacement and Coastal Defence assault sets. The paints were Airfix tinlets. I collected all the ones the box sides said I needed and as I wasn't allowed to use them I opened them up and sniffed them instead. (for doing well at school aged 7. Yeah, I know) and he used to stare at me doing this with much the same expression. You could see him thinking, WTAF are you doing? I miss the paints and the dog. The Airfix 1/72 Hercules, meh. After a few years the wings always fall off. The Coastal Defence fort was a blast – it fired little plastic shells and scales out at 13.5-inch calibre – but it never occurred to me to paint it. Don't leave us hanging – did you get in? Yes I did and they had this thing called a Wargaming Society. Apparently, if you want to fight battles with toy soldiers, you aren't just limited to flicking marbles, matchsticks and elastic bands at them. You can organise them into units, make playing rules and decide stuff by rolling dice. It seemed like a good idea that could catch on one day. I had some of the glass bottles too. I quite liked the later Airfix paints and tended to use them more as they were stocked locally. Humbrol had thicker pigment, though, and covered the multi-coloured Airfix kits without undercoat; even the black ones. Can't do that now. The last time I saw Airfix paints for sale was in a beachfront shop in Woolacombe in 1984! Yep, I reckon they were withdrawn in the late 70s. There could still have been some 5-year-old stock around in 1984. The bottles disappeared I think in about 1970. I never saw the bottles for sale anywhere, but my dad used them. I had my first box of Airfix figures in 1970 (I was 4) but I wasn't allowed to paint stuff until later. The last time I saw a bottle used was a dark blue colour my dad mixed up for my RAF ground crew in about 1975 (also worked for French foot artillery…). I'm not sure how practical they were, but I do remember them being very tactile! What nostalgia? I hated oil based paints (Humbrol and Testor) and the day I found out about water based paints and could put away my Varsol was a day of cheering. Never looked back. I have a couple of tins of Airfix enamel, M3 and M11, still perfectly usable. I used some M11 earlier this year. I never thought Airfix paints were quite as good as Humbrol, but these two have stood the test of time. Thanks for the reminder – I remember the thrill of spending a little extra as a child to get the exact right napoleonic humbrol paint – I even remember requesting 3 very specific tins for xmas.